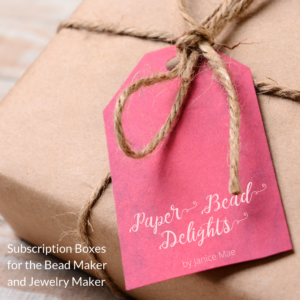 I love the idea of being the Paper Bead Princess! Which means that I can promote paper beads and get to inspire other like minded individuals to try making them. Diamonds and pearls are fine, but I also want to show the world that paper bead jewelry can be elegant and long lasting as well. 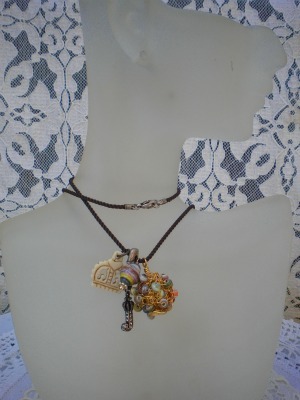 I am always drawn to making jewelry out of found objects must be the kid in me. 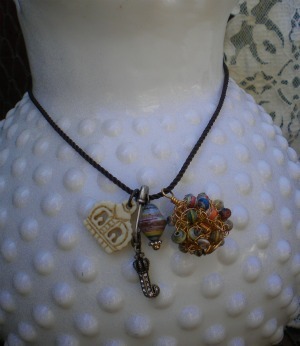 Here is one example of found objects with paper bead charm accents. What are they? The letter J and crown charms are from juicy couture perfume bottle. It was just the perfect charms for me as the self proclaimed Paper Bead Princess don’t you think? Hi princess, your ideas and your creations always are so original and so beautiful 🙂 but..please dear princess, could you explain us, how do you make this wonderful paper beads ball charm? Thank you in advance! you know I love to combine objects hétéroclytes to jewelry paper beads! so needless to say I like it …! and with the short side “luxury”, it’s perfect for our new princess! continues to be our model! Oh, how cute. Well done princess. You do a wonderful job inspiring people. I am always amazed at your creativity.